Scyllarus (sɪlɑːrʌs) is a set of tools that allows you to process Hyperspectral data and get meaningful results. Scyllarus uses powerful and advanced image processing techniques developed at Data61, to provide users with useful data for any number of applications. 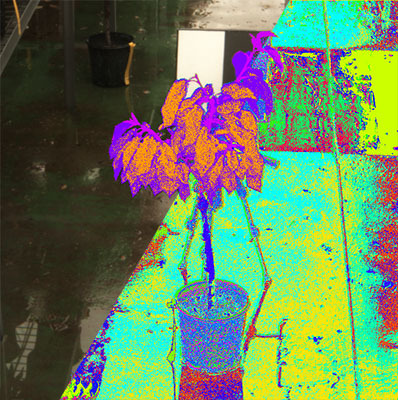 Whatever field you work in, there is probably an application where Hyperspectral Imaging could assist you! Our viewing and analysis tool ‘Scyven’ (Scyllarus Visualisation Environment) allows you to inspect Hyperspectral images, and analyse images to discover the spectral signatures that are present within the image. With one click, you can view an image’s material breakdown. For example, Scyven can show you what parts of an image are leaves, and further analysis could determine the condition of those leaves. For Researchers, our MATLAB® toolbox provides access to a wealth of image processing functions that can be used on Hyperspectral image data to recover various properties and perform analysis. The toolbox can be used to load images in the HSZ data format into MATLAB® to be processed for a variety of applications. The Scyllarus C++ API is available to developers looking to integrate highly optimised and state of the art Hyperspectral image processing into their own application. If you want to see some of the things the Scyllarus C++ API can do, check out Scyven, it’s powered by it! But What is A Scyllarus? Scyllarus is a genus of slipper lobsters, which includes the ‘Mantis Shrimp’. The Mantis Shrimp is known for its eyes, which are the most advanced eyes currently available. The Mantis Shrimp’s Hyperspectral eyesight aids it in many ways, allowing it to more easily recognise certain foods, detect predators, and send secret messages to its friends. This creature is being studied in the hopes that the advanced features of its eyes may yield advances in optics technology for humans. If you want to learn more about this marvelous creature, you can read about it on Wikipedia.